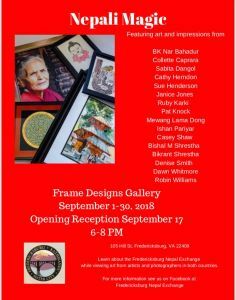 NEPALI MAGIC: Exhibit Celebrating Nepal-Fredericksburg Sister City. As cultural outreach of the Fredericksburg-Nepal Exchange, this exhibit has been a labor of love by artists from a spectrum of cities and across two continents. Throughout September, view artists’ expressions of the beauty of people, landscapes, and emotions—from two sides of the world, one in heart.